There are dozens of bullish reversal candlestick patterns. We have elected to narrow the field by selecting the most popular for detailed explanations. Below are some of the key bullish reversal patterns with the number of candlesticks required in parentheses. The hammer and inverted hammer were covered in the article Introduction to Candlesticks. This article will focus on the other six patterns. For a complete list of bullish (and bearish) reversal patterns, see Greg Morris' book, Candlestick Charting Explained. Most patterns require bullish confirmation. Bullish reversal patterns should form within a downtrend. Other aspects of technical analysis should be used as well. Patterns can form with one or more candlesticks; most require bullish confirmation. The actual reversal indicates that buyers overcame prior selling pressure, but it remains unclear whether new buyers will bid prices higher. Without confirmation, these patterns would be considered neutral and merely indicate a potential support level at best. Bullish confirmation means further upside follow through and can come as a gap up, long white candlestick or high volume advance. Because candlestick patterns are short-term and usually effective for only 1 or 2 weeks, bullish confirmation should come within 1 to 3 days after the pattern. To be considered a bullish reversal, there should be an existing downtrend to reverse. A bullish engulfing at new highs can hardly be considered a bullish reversal pattern. Such formations would indicate continued buying pressure and could be considered a continuation pattern. In the Ciena example below, the pattern in the red oval looks like a bullish engulfing, but formed near resistance after about a 30 point advance. The pattern does show strength, but is more likely a continuation at this point than a reversal pattern. The security is trading below its 20-day exponential moving average (EMA). Each reaction peak and trough is lower than the previous. The security is trading below its trend line. These are just examples of possible guidelines to determine a downtrend. Some traders may prefer shorter downtrends and consider securities below the 10-day EMA. Defining criteria will depend on your trading style and personal preferences. Candlesticks provide an excellent means to identify short-term reversals, but should not be used alone. Other aspects of technical analysis can and should be incorporated to increase reversal robustness. Below are three ideas on how traditional technical analysis might be combined with candlestick analysis. Look for bullish reversals at support levels to increase robustness. Support levels can be identified with moving averages, previous reaction lows, trend lines or Fibonacci retracements. Use oscillators to confirm improving momentum with bullish reversals. Positive divergences in MACD, PPO, Stochastics, RSI, StochRSI or Williams %R would indicate improving momentum and increase the robustness behind a bullish reversal pattern. Money Flows use volume-based indicators to access buying and selling pressure. On Balance Volume (OBV), Chaikin Money Flow (CMF) and the Accumulation/Distribution Line can be used in conjunction with candlesticks. Strength in any of these would increase the robustness of a reversal. For those that want to take it one step further, all three aspects could be combined for the ultimate signal. Look for bullish candlestick reversal in securities trading near support with positive divergences and signs of buying pressure. A number of signals came together for IBM in early October. After a steep decline since August, the stock formed a bullish engulfing pattern (red oval), which was confirmed three days later with a strong advance. The 10-day Slow Stochastic Oscillator formed a positive divergence and moved above its trigger line just before the stock advanced. Although not in the green yet, CMF showed constant improvement and moved into positive territory a week later. The bullish engulfing pattern consists of two candlesticks, the first black and the second white. The size of the black candlestick is not that important, but it should not be a doji which would be relatively easy to engulf. The second should be a long white candlestick – the bigger it is, the more bullish. The white body must totally engulf the body of the first black candlestick. Ideally, though not necessarily, the white body would engulf the shadows as well. Although shadows are permitted, they are usually small or nonexistent on both candlesticks. After a decline, the second white candlestick begins to form when selling pressure causes the security to open below the previous close. Buyers step in after the open and push prices above the previous open for a strong finish and potential short-term reversal. Generally, the larger the white candlestick and the greater the engulfing, the more bullish the reversal. Further strength is required to provide bullish confirmation of this reversal pattern. In Jan-00, Sun Microsystems (SUNW) formed a pair of bullish engulfing patterns that foreshadowed two significant advances. The first formed in early January after a sharp decline that took the stock well below its 20-day exponential moving average (EMA). An immediate gap up confirmed the pattern as bullish and the stock raced ahead to the mid-forties. After correcting to support, the second bullish engulfing pattern formed in late January. The stock declined below its 20-day EMA and found support from its earlier gap up. This also marked a 2/3 correction of the prior advance. A bullish engulfing pattern formed and was confirmed the next day with a strong follow-up advance. Note: The Bullish Engulfing candlestick pattern is similar to the outside reversal chart pattern, but does not require the entire range (high and low) to be engulfed, just the open and close. The piercing pattern is made up of two candlesticks, the first black and the second white. Both candlesticks should have fairly large bodies and the shadows are usually, but not necessarily, small or nonexistent. The white candlestick must open below the previous close and close above the midpoint of the black candlestick's body. A close below the midpoint might qualify as a reversal, but would not be considered as bullish. Just as with the bullish engulfing pattern, selling pressure forces the security to open below the previous close, indicating that sellers still have the upper hand on the open. However, buyers step in after the open to push the security higher and it closes above the midpoint of the previous black candlestick's body. Further strength is required to provide bullish confirmation of this reversal pattern. In late March and early April 2000, Ciena (CIEN) declined from above 80 to around 40. The stock first touched 40 in early April with a long lower shadow. After a bounce, the stock tested support around 40 again in mid-April and formed a piercing pattern. The piercing pattern was confirmed the very next day with a strong advance above 50. Even though there was a setback after confirmation, the stock remained above support and advanced above 70. Also, note the morning doji star in late May. The bullish harami is made up of two candlesticks. The first has a large body, while the second has a small body that is totally encompassed by the first. There are four possible combinations: white/white, white/black, black/white and black/black. Whether they are bullish reversal or bearish reversal patterns, all harami look the same. Their bullish or bearish nature depends on the preceding trend. Harami are considered potential bullish reversals after a decline and potential bearish reversals after an advance. No matter what the color of the first candlestick, the smaller the body of the second candlestick is, the more likely the reversal. If the small candlestick is a doji, the chances of a reversal increase. In his book Beyond Candlesticks, Steve Nison asserts that any combination of colors can form a harami, but that the most bullish are those that form with a white/black or white/white combination. Because the first candlestick has a large body, it implies that the bullish reversal pattern would be stronger if this body were white. The long white candlestick shows a sudden and sustained resurgence of buying pressure. The small candlestick afterwards indicates consolidation. White/white and white/black bullish harami are likely to occur less often than black/black or black/white. After a decline, a black/black or black/white combination can still be regarded as a bullish harami. The first long black candlestick signals that significant selling pressure remains, which could indicate capitulation. The small candlestick immediately following forms with a gap up on the open, indicating a sudden increase in buying pressure and potential reversal. Micromuse (MUSE) declined to the mid-sixties in Apr-00 and began to trade in a range bound by 33 and 50 over the next few weeks. After a 6-day decline back to support in late May, a bullish harami (red oval) formed. The first day formed a long white candlestick, while the second formed a small black candlestick that could be classified as a doji. The next day's advance provided bullish confirmation and the stock subsequently rose to around 75. The hammer is made up of one candlestick, white or black, with a small body, long lower shadow and small or nonexistent upper shadow. The size of the lower shadow should be at least twice the length of the body and the high/low range should be large relative to range over the last 10-20 days. After a decline, the hammer's intraday low indicates that selling pressure remains. However, the strong close shows that buyers are starting to become active again. Further strength is required to provide bullish confirmation of this reversal pattern. Nike (NKE) declined from the low fifties to the mid-thirties before starting to find support in late February. After a small reaction rally, the stock declined back to support in mid-March and formed a hammer. Bullish confirmation came two days later with a sharp advance. A small white or black candlestick that gaps below the close of the previous candlestick. This candlestick can also be a doji, in which case the pattern would be a morning doji star. The black candlestick confirms that the decline remains in force and selling dominates. When the second candlestick gaps down, it provides further evidence of selling pressure. However, the decline ceases or slows significantly after the gap and a small candlestick forms. The small candlestick indicates indecision and a possible reversal of trend. If the small candlestick is a doji, the chances of a reversal increase. The third long white candlestick provides bullish confirmation of the reversal. After declining from above 180 to below 120, Broadcom (BRCM) formed a morning doji star and subsequently advanced above 160 in the next three days. These are strong reversal patterns and do not require further bullish confirmation, beyond the long white candlestick on the third day. After the advance above 160, a two-week pullback followed and the stock formed a piecing pattern (red arrow) that was confirmed with a large gap up. A doji that gaps below the low of the previous candlestick. A long white candlestick that gaps above the high of the doji. The main difference between the morning doji star and the bullish abandoned baby are the gaps on either side of the doji. The first gap down signals that selling pressure remains strong. However, selling pressure eases and the security closes at or near the open, creating a doji. Following the doji, the gap up and long white candlestick indicate strong buying pressure and the reversal is complete. Further bullish confirmation is not required. In April, Genzyme (GENZ) declined below its 20-day EMA and began to find support in the low thirties. The stock began forming a base as early as 17-Apr, but a discernible reversal pattern failed to emerge until the end of May. The bullish abandoned baby formed with a long black candlestick, doji, and long white candlestick. The gaps on either side of the doji reinforced the bullish reversal. 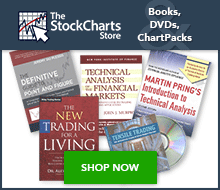 StockCharts.com maintains a list of all stocks that currently have common candlestick patterns on their charts in the Predefined Scan Results area. To see these results, click here and then scroll down until you see the “Candlestick Patterns” section. The results are updated throughout each trading day. Have you read our previous article on Candlesticks and Resistance? You may also be interested in our next article on Candlestick Bearish Reversal Patterns.